Jaxon Simmonx (left) with City of Peterborough Swimming Club coach Ben Negus. Jaxon (15) has become the fourth COPs swimmer guided by club coach Ben Negus to be identified as ‘world class’. Jaxon joins Callum Lawson (British and European title holder), Liam Knight and Harriet Lee (British and European title holder and London 2012 Paralympic bronze medal winner) on COPs’ growing world class roll of honour. Jaxon has already shown his world class potential as he currently holds the British record for the 1500m freestyle in the S13 classification. Jaxon’s classification is S13 because he has a visual impairment. Jaxon was one of just 44 Para swimmers named as having ‘podium potential’ based upon a rigorous assessment of both his and the club’s commitment to Jaxon’s training and development. Jaxon does not receive any financial support, but he will now attend Great Britain Paralympic training camps and both Jaxon and COPS will be monitored by a visiting support officer to ensure that his potential is achieved. 2016 is an Olympic year with the games being held in Rio de Janeiro, but Negus thinks Jaxon’s first opportunity to compete at world level will come in the 2017 or 2019 World Championships. ‘We are quite determined but also realistic that Jaxon will achieve this identified level of competition,” Negus said. “Our aim for this season is for Jaxon to break the British record in the 400m freestyle which will place him quite high in the World rankings. There are currently two other S13 swimmers who are well ahead of the rest in the rankings, but they are also older than Jaxon. Harriett Lee was also named on the ‘podium potential list’. 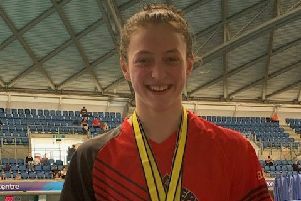 She now swims for Northumbria University.